Puppy separation anxiety is the stress that your puppy experiences when he or she is left alone. They often become depressed or afraid because they do not know if or when you are going to come home. You may recognize this anxiety by your dog barking when you close the door or they may make a mess of the house when you are gone. This article is going to explore some other signs and symptoms of puppy separation anxiety as well as a few tips to help your control the negative stress. If you leave your dog at home and return to find a mess or that your dog went to the bathroom in the house, your puppy may be suffering from puppy separation anxiety. While this is common, it does need to be taken care of. 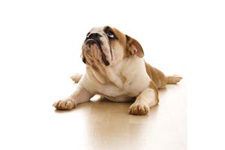 Your puppy may become so stressed out when you leave that he or she is even throwing up. This is not healthy for your dog and it makes them very unhappy. However, we all work and we need to leave our pets from time to time. Therefore, you may want to start controlling this anxiety by teaching your dog to stay in a crate when you are not home. This is going to be a safe place for your dog to retreat when you are not there. You will want to start your dog out in the crate for a few moments at a time. You may want to place a blanket or some toys in there so that your dog will feel more comfortable in there. You will work with your dog for a few days by putting them in the crate and taking them out. This is going to help your dog get use to their own space. They are going to begin to feel comfortable in there and they are going to learn that you will always be back to let them out. Your dog can go to his or her crate when you need to leave the house. Another trick you can try to decrease puppy separation anxiety is to start ignoring your dog a few minutes before you leave and for a few minutes when you return. If your dog is use to be cuddled and pet all day long they are going to feel some strong emotions when it is time for you to leave. You will be preparing them for some quiet, alone time while you are away. You are also going to decrease the stress that goes along with the hyper behavior of your return. You never want to reward negative behavior. Therefore, if your dog is crying and whimpering when you leave and when you return, you are not even going to want to look at your dog. You do not want to give your dog any attention for that type of behavior. You will want to go so far as to avoid eye contact when inappropriate behavior is being exhibited. Medication can be given if the puppy separation anxiety is that severe. However, this needs to be the last thing you try. You should never give your dog anything without talking to your vet first. If your vet does not think a medication is what your dog needs, you may want to consider talking to an obedience trainer. This individual is going to know what you can do to help your dog learn to relax while you are away. He or she is also going to give you some tips to help make the transition of you leaving a little bit easier for your pet.